As one of the best-selling Intermediate Spanish titles, the third edition of ¡Avance! continues to develop students' functional, communicative language skills through reinforcement, expansion, and synthesis of the concepts learned in the introductory course sequence. ¡Avance! offers contextualized activities that review language and foster skill development, while at the same time, preparing students to continue their Spanish major or minor coursework and for real-life communicative tasks. Recognizing the need for cultural competence simultaneously coupled with the desire to introduce students to literature at the intermediate level, the 3rd edition of ¡Avance! includes cultural and literary texts in every chapter, creating a program that meets instructors' demands that intermediate-level instructional materials be not merely contextualized but also content-rich and interesting, as well as motivating to today's students. The modern Spanish classroom is changing as are the teaching and learning experiences we all want to provide our students. Professors are offering more hybrid and online courses or, at a minimum, are seeking technology to extend learning outside of the classroom in truly effective ways. As such, professors are searching for more types of homework tools, better reporting features, and cutting-edge functionality to meet the demands of their courses and the needs of their students. 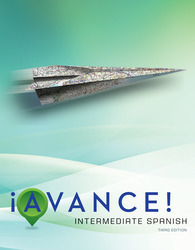 Connect Spanish, McGraw-Hill's digital platform which accompanies the third edition of ¡Avance!, offers state-of-the-art resources never before available to intermediate Spanish, to address the varying levels of communication of intermediate Spanish learners with proven outcomes that improve student learning in measurable ways. The third edition of ¡Avance! is comprised of an array of integrated print and digital offerings, giving you the maximum flexibility to choose the most appropriate format and content for your courses. The Práctica activities are now available in Connect Spanish, allowing students to complete form-focused practice at home. Using new speaking prompts provided in Connect, instructors can now better evaluate and gauge students' developing oral proficiency and provide additional out-of-class practice to monitor and promote students' advancement in this critical skill area. Seventy-five percent of the literary readings (Del mundo hispano) have been updated; literary readings are now included in every chapter. All-new comprehension questions offer a follow-up to each cultural passage to gauge students' comprehension and promote deeper understanding of the cultural information while simultaneously improving their communication skills. The new Cinemateca section provides pre- and post-viewing activities to accompany scenes from selected Spanish-language films (films not included). All instructors materials are now available electronically with Connect Spanish for ease of access. Connect Spanish includes an interactive ebook, the complete Workbook/Lab Manual, grammar tutorials, and all audio materials. Available within Connect Spanish and as a mobile app, LearnSmart provides students with targeted feedback specific to their individual performance, and additional practice in areas where students need help the most. Connect Spanish includes a comprehensive gradebook to view your assignment results. Describir y comentar activities jump start the theme, vocabulary lists, and Conversacíon activities. Avance continues to offer grammar structure explanations with embedded practice (Práctica), followed by the Autoprueba, and then Conversacíon activities, designed for communicative practice. Lectura cultural: La cocina es una celebración que merece celebrarse. Lectura cultural: ¿Cuándo se llega a la edad adulta en el mundo hispano? Mary Lee Bretz is Professor Emerita of Spanish and former Chair of the Department of Spanish and Portuguese at Rutgers University. Professor Bretz received her Ph.D. in Spanish from the University of Maryland. She has published numerous books and articles on nineteenth- and twentieth-century Spanish literature and on the application of contemporary literary theory to the study and teaching of Hispanic literature. Trisha Dvorak is Senior Program Manager with Educational Outreach at the University of Washington. She has coordinated elementary language programs in Spanish and taught courses in Spanish language and foreign language methodology. Professor Dvorak received her Ph.D. in Applied Linguistics from the University of Texas at Austin. She has published books and articles on aspects of foreign language learning and teaching and is co-author of Composición: Proceso y síntesis, a writing text for third year college students. Carl Kirschner is Professor of Spanish and Dean of Rutgers College. Formerly Chair of the Department of Spanish and Portuguese at Rutgers, he has taught courses in linguistics (syntax and semantics), sociolinguistics and bilingualism, and second language acquisition. Professor Kirschner received his Ph.D. in Spanish Linguistics from the University of Massachusetts. He has published a book on Spanish semantics and numerous articles on Spanish syntax, semantics, and bilingualism, and edited a volume on Romance linguistics. Rodney Bransdorfer received his Ph.D. in Spanish Linguistics and Second Language Acquisition from the University of Illinois at Urbana-Champaign. He has taught at Purdue University, the University of Illinois at Chicago, and Gustavus Adolphus College. He is currently Professor of Spanish at Central Washington University. He has presented papers at national conferences such as AATSP and AAAL. In addition to his work on the Pasajes series, he has authored or co-authored several other McGraw-Hill titles including: ¡Avance!, Second Edition (2008), ¿Qué te parece?, Third Edition (2005), the instructor's annotations for Nuevos Destinos: Spanish in Review (1998), and the instructor's annotations for Destinos: Alternate Edition (1997). Constance Moneer Kihyet is Professor of Spanish at Saddleback College in Mission Viejo, California, where she currently teaches a wide range of courses in Spanish language and Latin American civilization, culture, and literature. She received her Ph.D. in Spanish from the Florida State University in 1979, specializing in Golden Age literature. Her interests and publications include studies of Golden Age and nineteenth-century Spanish literature, as well as aspects of second language acquisition, teaching methodology, and literary translation. In accordance with her interest in Golden Age literature, she recently completed the translation of the Adventures of Espandian (1587) for the historical text The Chronicles of California's Queen Calafia (2007). She has written test bank materials for the Pasajes: Lengua program and is co-author of the test bank of Puntos de partida, An Invitation to Spanish. Professor Kihyet is also co-author of El mundo hispano, An Introductory Cultural and Literary Reader, Con destino a la comunicación, Avance: Intermediate Spanish, First and Second Editions, as well as Pasajes: Literatura, Fifth, Sixth, and Seventh Edition.